Mesa Marin Raceway opened its gates for the first time in April of 1977. It was immediately recognized as the "West's Fastest Half Mile." 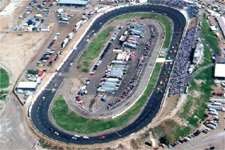 Throughout its 20-year history Mesa Marin has hosted NASCAR-sanctioned events which include the NASCAR Winston West Series, the NASCAR Featherlite Southwest Tour Series, the NASCAR Winston Racing Series and the NASCAR Craftsman Truck Series. Mesa Marin Raceway played a critical role in the development of the NASCAR Craftsman Truck Series. In the winter of 1993, NASCAR Craftsman Truck prototypes took shape at West Coast Race Car Fabrication, located adjacent to the track. The prototype truck project went from concept, design, construction and testing in a short four-month period. Mesa Marin then hosted the first ever NASCAR Craftsman Truck exhibition even on July 30, 1994. Mesa Marin is proud to be able to contribute to the success of NASCAR's newest and hottest series. Today Mesa Marin hosts a full schedule of NASCAR events from March through October, with its season-ending October Classic serving as the crown jewel of its action-packed schedule. The October Classic has grown from a one-day event to a four-day NASCAR racing festival featuring corporate hospitality, expositions, product displays, media events, contests, fireworks and live entertainment. Racing action over the four-day October Classic features the NASCAR Winston Racing Series 150, the NASCAR Featherlite Southwest Tour Series 200, the NASCAR Winston West Series 250 and the NASCAR Craftsman Truck Series 300. Location: From Los Angeles, Interstate 5 north, to Highway 99 north. Take Highway 178 east 10 miles. BALLPARKS © 1996-2017 by Munsey & Suppes.